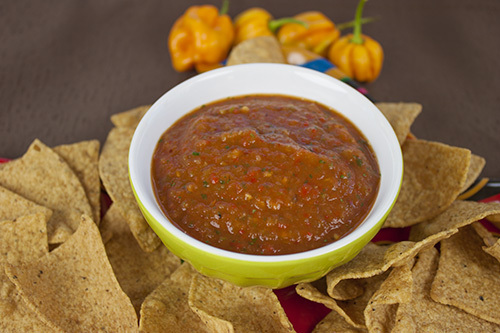 Roasted habanero peppers and sauteed mango come together to create a highly flavorful salsa that is slightly sweet. It serves up great as a traditional salsa, but also as a topping for fish. Slice tomatoes in half and set them onto a lightly oiled baking sheet. Stem and de-seed the bell peppers. Slice into quarters lengthwise and set on the baking sheet. Heat a sauté pan to medium heat. Add olive oil and mango. Sauté for about 6-8 minutes or until mango is brown. Peal skins from tomatoes, jalapenos and bell peppers and add to a food processor. Add habaneros, cilantro and salt to taste. Process until smooth.